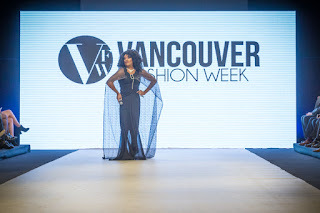 As I sit through all shows every day at Vancouver Fashion Week (VFW) each season, I skip the opening gala. That means Tuesday was my exciting first day at VFW Fall/Winter 2016. 14 shows were going to be presented by 12 designers, but Shinya Yamaguchi had to be moved to another night because his collection had not yet arrived. No worries, the night was still full. Our host was the lovely Symone Says and she rocked the evening as always. One thing that stood out to me last night was how many new faces were in attendance. I LOVED IT! Meeting new people and sharing in their excitement of attending their first fashion week ever is a high for me. Then there is the re-connection with friends you haven't seen in awhile. The runway was always full of well-dressed people snapping pics between shows. The Chinese Cultural Center on Pender Street in Vancouver really has become home base for VFW's twice yearly fashion week. The great surprise was the new seating arrangement. In past seasons the front row was folding chairs on the floor with tiered bench seating behind. This season the tiered risers have flat levels with padded folding chairs on each. A very classy improvement and so much more comfortable. The front row is also back further from the runway up on the first tier which helps with the crossed legs that put feet out in the photographers view finder. Also, if one night has a higher attendance and needs extra seating, a row of chairs can still be added on ground level in front. Kudos! I want to remind everyone that because of timing, I can only cover a few shows each day. 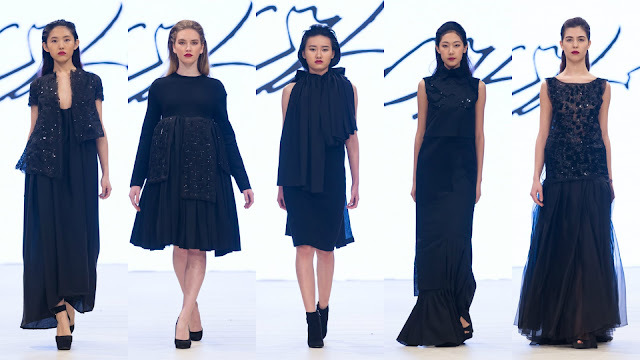 You really need to check out the other shows as the line-up included many wonderful designers. AND all VANCOUVER designers are going to be featured in a separate BUY LOCAL column which I will add to as quickly as possible. 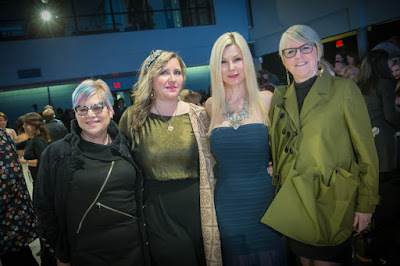 With tons of local designers showcasing, I may not be able to get that coverage up each day as I have to wait for photos to be available, but will post links as new show recaps are added. NOTE - an extra treat today!!! Normally I only include 5 images from each designer, but Ed Ng Photography stayed up all night to offer 10 from each collection. Don't know if he can continue this pace all week, but THANKS ED! Grace CY Lam definitely has an international eye as she was born in Hong Kong and lived in Brisbane. Canada and Australia. 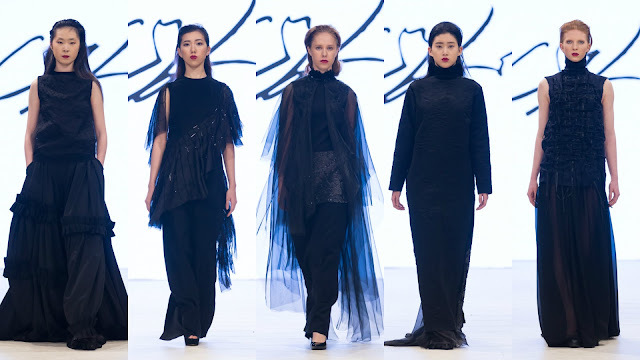 She studied locally at Langara (fine arts), UBC (fine arts/painting), Blanche Macdonald (stage and special effect make-up), Hong Kong University (legal studies) and findally a BA in Fashion Design from Hong Kong Raffles International College of Design. And she's a mum. I'm impressed. Lam's collection this season was inspired by Gustav Klimt's three wall painting - BEETHOVEN - "...that depicts the human naturals and desires, our being's struggling and desire to triumph over adverse forces." Lam focuses on detail and rich fabrics - each garment a small piece of handcrafted art. What we saw on the runway last night was elegant, luxurious, modern evening wear - all dresses in classic black and most with an added touch of black sparkle to catch the light. The dresses were beautifully tailored and hand detailed with just the right touch. I love the fabrics Lam used and how she combined them. With an all black palette, the elements were offered in a high end, understated way. You had to really look closely truly see how beautiful each piece was. 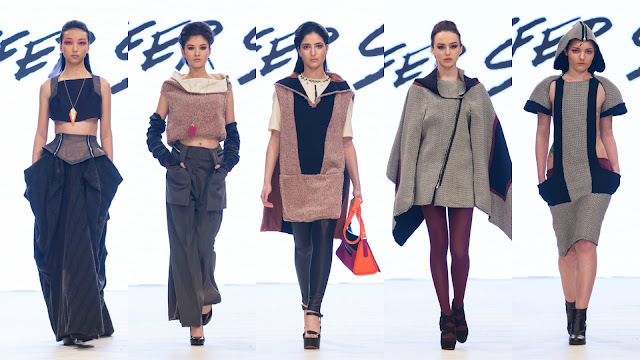 Venezuelan designer Jennifer Somoza is both a fashion designer and architect. She has a passion for the unknown and loves to look at the existing masks that surround the fashion world. The designer chose to study in Rome and fell in love with the Italian tailored technique and the making of haute couture. Mixing these loves with her innate artistry are the key elements behind her brand. What we saw on the runway was wearable, but each had an interesting twist, a unique element, a bit of surprise. You had to look that bit closer to figure out what caught your eye. I loved the mix of fabrics and textures, and the surprise details scattered throughout. I think this quote from her bio helps explain it all, "Jennifer Somoza was created as the alter ego of an artist, that wild artist that everyone has inside, the artist that wakes up very early in the morning to paint the walls with a throw of a bucket or the one who sketches in a notebook all the ideas that came up after a weird dream, that artist who is full of anger, full of love, full of doubts or happiness. Put it all together in a balloon that with the lightly touch of a pin breaks out!" While Gabrielab was not the last show of the evening, I put it as the closing review because it was eye-catching and truly unique. Brazilian designer Gabriela Baga's label was launched in 2014 - a mix of bright, colorful knitwear. Her first collection, Padre António, won the Brazilians To Be design competition at the Casa de Criadores Fashion Week in Sao Paulo. The line currently sells in China, Japan and Brazil and has taken part in StyleTv Shanghai during SFW AW15. Production is all done in Brazil and the exclusive "prints" created over many hours of research. Baga wants the women who wear her designs to express the spontaneity and joy of their inner girl. I am privileged to be allowed to wander backstage before the shows begin to meet designers and look at the collections on the hangers as, once the shows start, I need to stay near my seat all night. This collection really popped for me and there was one piece - the white top with the King Louis the 14th in the image, 2nd from right in the top strip - that I would love to see in my closet. The designer shared the inspiration was King Louis the 14th and Moths To A Flame - his servants being the moths who circled his flame. I can tell you, from the moment the first look turned the corner everyone sat up and smiled. The looks were fun, bright, energetic, colourful and easy to wear. The choice of wigs and make-up turned it up a notch. This is one designer I am will have my eye on. Hope she returns so we can do a sit-down interview..